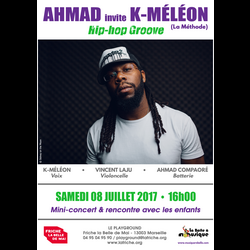 Short concert (hip hop groove) and meeting with the children. A proposal by La Boîte à Musique with the support of Friche la Belle de Mai. 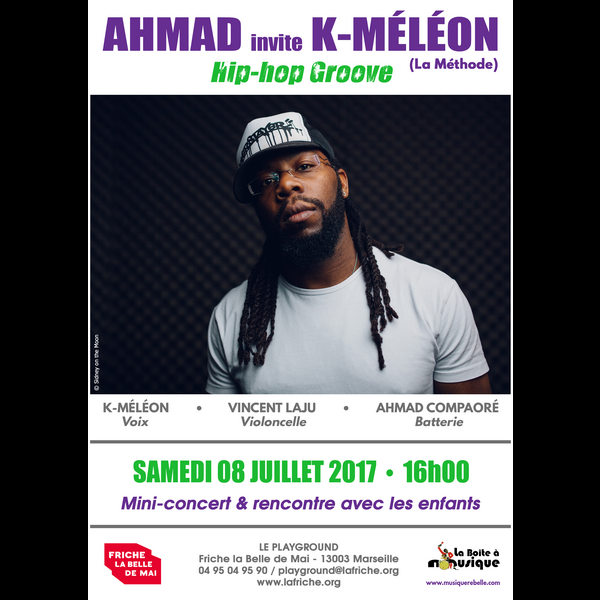 A key figure of the Marseille music scene, K-méléon is member of the hip hop band "La Méthode" and livener M.C. from the ace duo "Block Party" with Dj Djel (Fonky Family) at the turntables. He takes his first steps in the hip hop movement through dance, beatbox and improvisation, where he wins several prizes. A genuine showman, K-méléon has a knack for setting the crowds on fire by the sole power of his mike. At the invitation of drummer Ahmad Compaoré, this unusual trio promises a subtle chemistry of sound effects and essential groove, for a successful fusion of genres. Le Playground, Friche la Belle de Mai, 41 rue Jobin, 13003 Marseilles.